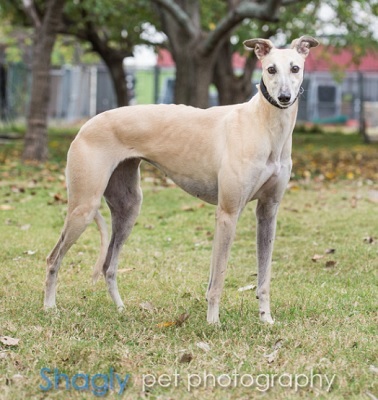 Goldleaf is a 5 year old fawn female born in 2012. She was part of the population from the blood bank facility located in Cherokee, TX that closed in November 2017. Goldleaf has been medically evaluated by GALT's veterinarians and has completed all her medical procedures. This beautiful girl is ready to find her forever home. It is not yet known if Goldleaf is small animal or cat tolerant. Please check back periodically for updates on Goldleaf as her journey to a forever home unfolds. She comes up to my husband and me fairly equally, though she is initially more comfortable with females. If you're familiar with the chattering trait among Greyhounds, Goldleaf certainly has it mastered. I can be lying down and then hear a buzzing sound in my ears, which means she’s coming for some rubs and loving! She loves to go outside during the day, especially with the other dogs. When she's in the backyard, she likes it when people are around but she will wait to come inside until you’re far from the door. She is perfectly house trained, though you may have to encourage her to go outside at night because she gets too comfy in her bed! 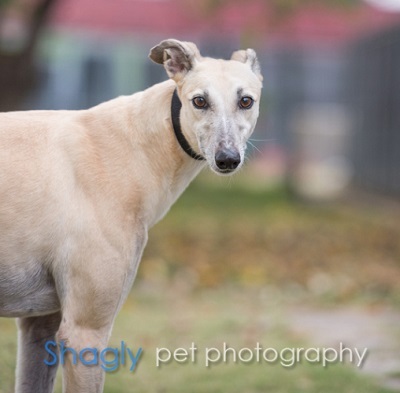 Goldleaf is as sweet and pretty as can be and would be a great addition to a loving home, with a yard and preferably one or more with other dogs to show her the way.